Selling out to the highest bidder. What a crock. People all across the US give 1,000 dollars and more to candidates, politicians and campaigns. I know tons of people who contribute that amount and more, because they believe in the politician. Not that you will post this. But you can check through contributors for every politician who exists (democrat and republican) and find someone who donated to their campaign who was either a criminal, shady character or lobbyist (wait a minute I already said criminal). Can we say Louisiana? So why is it when a Republican receives a contribution, you go stark raving mad, because he isn’t a Democrat. If it had been a Democrat with $90,000 dollars in his freezer, it would have been brushed under the rug. You're right, Dusty, that money is a very corrupting influence on Democrats as well as Republicans. But we are talking about Norm Coleman here. If he isn't into it for the money, why is he doing politics at all? 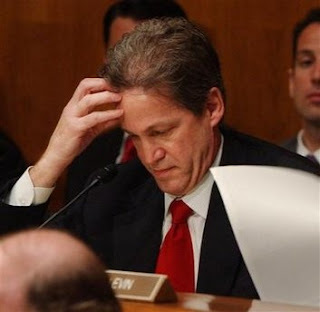 Unlike the true neocons, who are willing to take risks and make sacrifices for their beliefs, Norm Coleman seems to have no moral compass at all. He is more like a weather vane, turning and turning as the wind changes.